We are thankful for Your men who have dedicated themselves to the proclamation of Your Holy Word. Father, tomorrow those of us who preach will be blessed with a special opportunity. People will attend our assemblies who are not accustomed to being present for worship. There may be some present who haven’t attended in a year or longer. Many of these folks are expecting to hear about Jesus. Help Your preachers to tell them about the Savior. Help Your men to proclaim Jesus with every amount of knowledge, zeal, wisdom, compassion, and love that we have within us. May we preach Christ in such a way that will create a thirst to know Him in those who hear the Word. Not because of us, but because of our love for our Lord. Help Your preachers to speak the truth in love. May Jesus be paramount in our hearts, our minds, and our Words. We praise You for Your goodness toward us. We thank You for these your servants who desire to be used by You as vessels through which You work in accomplishing Your eternal purposes. We give You the glory and the praise for every good gift You shower upon them. We give You thanks for opening doors of opportunity for them to speak the Gospel. 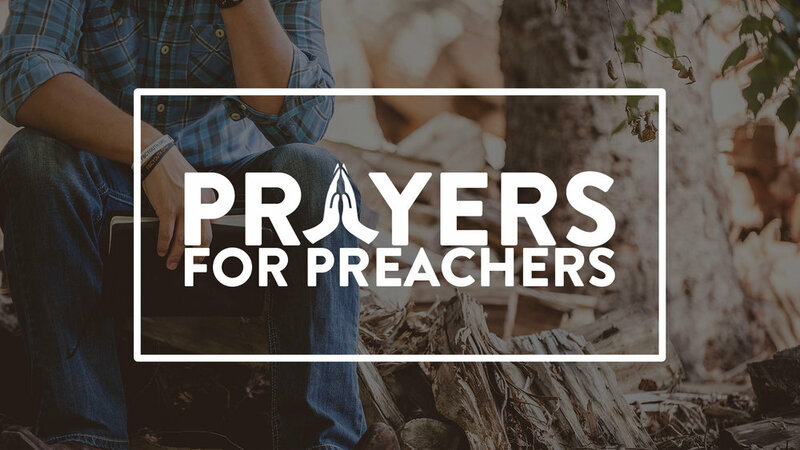 We pray that those who hear Your preachers tomorrow will experience joy, peace, comfort, encouragement, and a life changed for the better. Our prayer is that when they leave, they will not say, “What a great preacher.” Our prayer is that when they hear Your preacher they will say, “What a great God we serve!” May You be pleased with everything they and we do and everything each of us say. We are thankful to You for allowing us to be the vessels that deliver the richest treasure known to man. When we consider this wonderful blessing, understanding our weakness, we are humbled. We pray that You will help every one of us who will preach the Word to remember Your promise that You will not allow Your Word to return unto You void. Help us never forget that as long as we faithfully proclaim the Truth that we cannot fail. Help us to remember that our words should be Your words. Please dear God, give each of Your men an extra helping of grace and graciousness. May our hearts be Holy. May our souls be sanctified. May our conscious be clear. May our doubts be defeated. Help us to be on fire for You as we proclaim Your Holy Word. In Jesus Beautiful Name we Pray, Amen. Thank You for Your church. In it You desire that we gain strength, encouragement, and that our faith grows from our association with it. We are blessed to be Your servants and to minister within it. We pray that tomorrow new people would come to the congregation where this servant serves. Father, we pray that he will be welcoming, that he would be at his best, that his words would touch both heart and head and would draw people to Your Son and thereby give them true hope regardless of what they are dealing with in their lives. May his words connect with people in a manner that connects them with Your Word. Some of Your men who will be preaching your Word on Sunday, have had a particularly tough week. Maybe they are dealing with their own illness, or the illness of someone close to them. Perhaps they have lost someone this week who was dear to them, and it has been a huge loss to their life. Some may be struggling with their faith or they’ve endured unusually harsh criticism from a leader, a co-worker, or some “well-meaning” fellow Christian. Our prayer tonight is for any of Your men who feel burdened with life and who will preach through their pain. Please help them to know that You care, that You are aware, and that You are with them. May we never forget that You are the God of healing, the God of peace, the God of mercy & grace. For that knowledge we are most grateful. Tomorrow many who read this will stand before some of Your People and teach from Your Word. We pray and trust they would be true and faithful to that Word. Father, as they go through the day they will interact with hurting people, with people questioning their faith, with people who have tests they are undergoing, with people whose faith is attacked at school, work, or home, with people who are growing older and have concerns about death, with people who are new to the faith and trying to learn to navigate the Word, with people who have been Christians a long time but still are immature, with people who appear to be mature but often do not behave that way, Father, would You so equip them that they may be a blessing to each of these in the manner most needed. Our prayer for every Gospel preacher is that You will bless them in every way, as they prepare to speak Your Word to Your people. Like Paul, we pray that out of Your glorious riches that You may strengthen them with power through Your Spirit in their inner being. Like Jabez, we pray that Your hand would be with them, and keep them from harm so that they will be free from pain. Like David, we pray that You will search us, O God, and know our hearts; that You will try us and know our anxious thoughts; And see if there be any hurtful way in us. Like Nehemiah, we pray that You will make Your servants successful. Like our Savior, we pray that the love with which You loved Him may be in Your servants as we proclaim Your Truth on the Lord's Day. We pray for those who will stand tomorrow and teach or preach Your eternal Word. As we face an audience most of us will also face a clock. For some of us that clock seems to drive us at times. Help us to not allow it to ever keep us from saying what we should say as Your servants. Father, may he not feel rushed but practice economy of words and use just those words that will communicate Your Message clearly. Thank You for the peace that Your Word brings, may it bring peace to the hearts of these Your servants as they present it tomorrow. 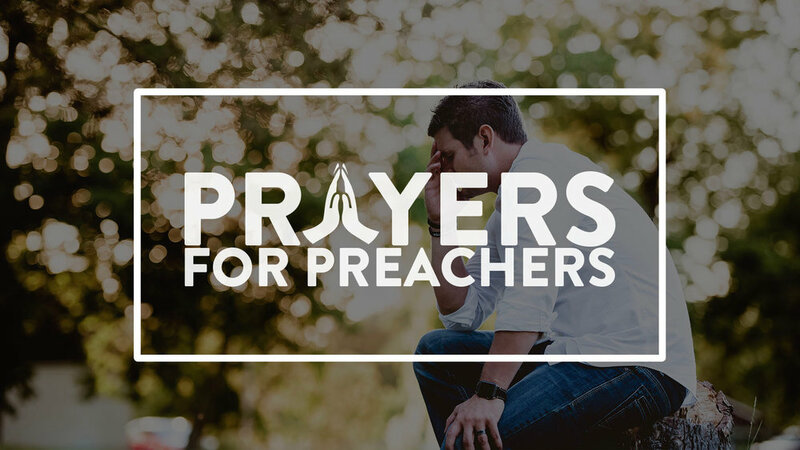 Dear Heavenly Father, We pray today for preachers around the world that You will bless them with an extra helping of patience. Give them patience as they consider the words they will speak for You. Give them patience as they deal with distractions. Help them Father, to be patient when everything doesn't go as it should on Sunday. Help all of us to be patient with people who speak unkind words, people who are stubborn, and people who seem not to listen. Dear God, give Your men patience as they wait for the seed that is planted to take root in the hearts and lives of those who hear. Give them patience as when they have to deal with difficult people. Give them patience Father with themselves, as they seek to get out of the way and allow Your Word to work. Thank You for Your patience with us and may we grow in our patience as we seek to become more like You. In Jesus Name we Pray, Amen. We thank You for the promise that Your powerful Word will not return to You void, but that it will accomplish what You intend. We pray today for the men who will stand before Your people around the world and proclaim that Word. May the knowledge of this promise help us remember that we preach Your Word, not ours. Dear God, help Your preachers to preach all the Truth and only the Truth. Free us from any human tendency to make preaching about us. May our study be saturated in Scripture and may our presentation be focused on Your Will. Help us never forget that we must preach the Truth in love, if we would be obedient to You. Help us to You, Your Word, and those to whom we preach. Holy Father, Our prayer for all of Your men who will be preaching Your Word on Sunday to Your people is that we will never forget the urgency of the task before us. May we feel the weight of the Gospel message on our hearts. Father, help us remember that every soul is important and that the only cure for broken lives, broken hearts, broken homes, and hungry souls is Jesus. Help us be aware that our greatest need and the greatest need of those who hear us is Jesus. Dear God, We pray that every one of Your men who stand before Your people on Sunday will feel in their heart the burden of preaching Jesus. In His Matchless Name we pray, Amen. As many who read these words are thinking of classes and sermons and ministering to others tomorrow we pray that their focus will be sharp and their commitment to Your Word above any personal agenda would be sure. May their love for Your people be clear. May they be a light and may they bring Your light to others. As the week goes on many who read these words will spend some time with their fellow ministers. May they avoid bragging or exaggerating, may they not be discouraged when others work might be flourishing and they feel their’s is inferior, may they rejoice in good and may they see good, may we enjoy these days to the max and truly be encouraged by the time with each other. May each remember our perfect Minister/Mentor, Jesus and may we strive to be like Him. May Your grace and peace be with those who desire to be with others but cannot. If we are honest with ourselves, we confess that we live with uncertainty at times. We feel uncertain about our ability to do what You want us to do. We feel uncertain about our study. We feel uncertain about our knowledge. We feel uncertain about our preaching. Holy Father, we pray that You will replace any uncertainty in Your men with certainty. Dear God, please fill their hearts and minds with certainty. Certainty about the proclamation of Truth. Certainty about Your promises to be with them as they go about their work. Certainty in the Message. Certainty in the Cross. Certainty that Your Word will not return unto You void. Thank You, dear God that our certainty does not have to be found in us. We pray that we will always seek certainty in You. In the Name of our Savior we pray, Amen. Ministry seems to take a little of our soul. It is sometimes wearying. Father, the headaches and heartaches, the pressures, the big things and the little things replicated hurt Your men. And eventually many of them lose their passion for preaching. The weight of it all and the issues they can seem overwhelming. And over time our passion for the congregation, the work, even preaching wanes. We know that You understand. Father, we ask today, that You restore that passion. May these men who hold forth Your Word be renewed. May they be reminded of the great mission of bringing Good, life-changing News to others. May that passion rekindle first in their heart and then in the hearts of those who hear them a renewed zeal to tell others about You and Your Son and Your Grace and Your Message. May they awake tomorrow with a zeal and a fervor to bring Your Words with passion to those who hear them. We ask that you bless them. Our prayer for Your men who stand in front of Your people to preach Your Word is that they will be men of focus and men of love. We pray that their focus will be on preaching the Truth in love. We pray that they will focus on proclaiming Your entire counsel. We pray that their focus will be speaking Truth in season and out of season. We pray Father, that Your men will focus on the cross of Jesus and that they will stand behind that cross. Father, we pray that they will be men of love. We pray that these men will love Your Word. We pray that they will love the people who gather to worship. We pray, dear God that they will love the lost. We pray that Your men will love the Church that has been purchased with the blood of Your Son. Father may Your preachers love You supremely. In the Name of our Savior, we pray, Amen. Thank You for the hope found in new things. You have set in order this newness of things: new mornings, new moons, new beginnings at our salvation, new starts at our realization of wrongs, new energy with rest. Thank You. May these your men be fresh as they begin a new year of preaching and teaching tomorrow. While everything has not changed, this is a new year. May these who stand before Your People with Your Word find renewed energy and passion for teaching and preaching. May they be able to move forward from the old and into the new. May they find the strength to change those things within their power, to let go of those things that are not, to confront appropriately, to care for all around them, to fulfill their ministry. May this year be a good one in every good way for them. May they know they are loved by many but most of all may they feel Your love for them. Bless them and thank You for them. We are thankful for the men who have spent the week preparing their hearts, their minds, their thoughts, and their words that they will deliver to the Church on Sunday. Father, they will preach to some people who believe that Sunday is the only day they work. That fact alone, causes some of us to believe that Sunday is our day, our time to shine, our time to prove to people the worth of what we do. Dear God, please deliver us from this mentality. Help us never forget that this is not our day. It is not the church's day. It is Your Day. Help us to remember that it is the Day that we must do everything within our power to let Your love, Your Word, Your Power, and Your Strength shine. Father, deliver us from thinking that we have something to prove about ourselves, other than the fact that we are Your servants and the vessel through which Your Word is delivered. Help us Dear God to call those who hear us to You, help us to focus every heart on Your Glory, and help us to dedicate all that we have, as well as all that we are to You. We pray today for the men who will strive to bring Your light into the hearts and daily lives of those who hear them tomorrow. Bless them. They are continually overworked and under-appreciated, they give without expectation as they strive to model You. Thank You for these little lights in a darkening world. I pray that some will show and express their love for these men tomorrow. That they might see some of their effectiveness and importance in the lives of those to whom they minister. But even if not, I pray that they will be overwhelmed with the Truth of Your love for them. Father, with hectic schedules and pressure to deliver, may they find peace as they preach of the Prince of Peace. I pray that it will be a good day for each of them in Your Service. As preachers around the world stand before their church families on Sunday, we pray that they will never forget that they are not alone. Help us to remember that we are a part of a vast fraternity of preachers who are proclaiming Your Truth. Help us to remember that a great cloud of witnesses surrounds us. Dear God, help us never forget that You are with us as we prepare our minds, as we pray about our work, and as we preach Your Word. May Your preachers be encouraged and strengthened by these truths. Help them to know that they are loved, appreciated, and cared for as they go about their work for You. May these thoughts fill their hearts, minds, and souls as they stand before Your people. Thank You for revealing Your Will to us clearly. Thank You for telling us what we need to know, believe, trust in and for leaving what we do not need to know hidden. From that knowledge these who will preach and teach tomorrow have developed deep convictions. Father, help us to know which of those convictions are worthy of presenting and to then present them in a humble manner that glorifies You and builds the faith of those we speak to. May we never compromise those convictions that are grounded in Your Truth. May we know how to hold convictions without being mean or turning those who might disagree with them from You. Help us, even as we speak, to remember to speak in love. May each be blessed to find the right words to communicate Your ever Right Word and may Your People hunger for it and be delighted by it. Thank You for men who stand for Your Truth. Bless them and increase their number.